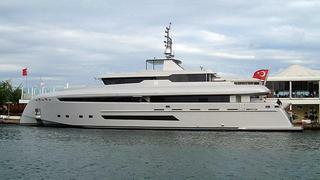 The 40 metre motor yacht M has been launched by Bilgin Yachts. Although she was rolled out of her shed in November 2011, her launch was delayed until this year, as Bilgin sales manager Yildirim Bilgen, explained to us in 2011: 'We have decided not to launch any of our yachts in 2011; instead we’ll prepare them for a relaxed launching in 2012?. M is the first launch scheduled in 2012, to be followed shortly by the first Classic 160, Antinea. Designed by H2 Yacht Design, M is distinguished by her strong lines and reverse bow. Her interior, also designed by H2 Yacht Design, will accommodates eight guests in a master and three double cabins. Her twin 2,400hp MTU engines will give her a top speed of 20 knots and a cruising speed of 16 knots. M will be starting her sea trials immediately and will be delivered this summer.